Imagine owning a sports business that continued for well over 100 years and during that time had a winning record against all comers of over 83%? In the Test arena – playing only against the best teams that all the other nations in the world can put up against them – that winning percentage is over 75%. That is winning three quarters of the games played for over a century against the best the world can throw against them. It is a phenomenal record, and arguably makes the New Zealand All Blacks the most successful sports team in the world ever. As with any incredibly successful organisation there are lessons for anyone else who aspires to achieve excellence. A quick disclaimer at the front end if I may: I am not an All Blacks supporter. Unfortunately they repetitively beat my team….but I know true excellence when I see it, and have long been intrigued with the culture that can produce such lasting success. With well over 1,000 players having represented the All Blacks during that time, it cannot simply be about having some good players. 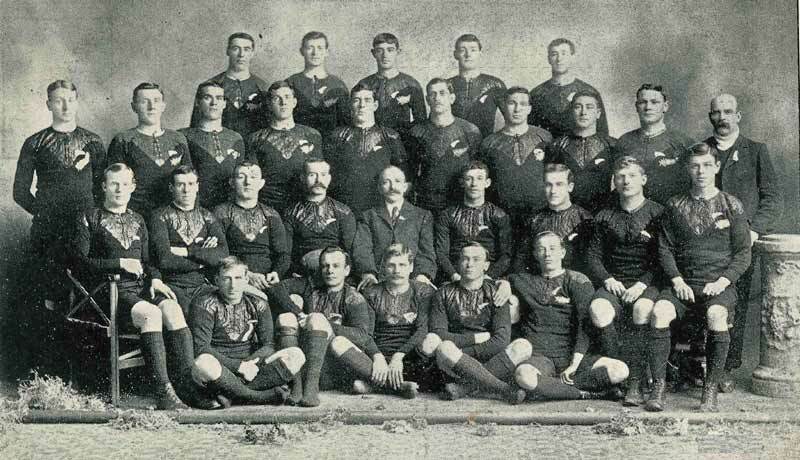 Rugby has become THE sport in New Zealand…but in part that is because the All Blacks give New Zealanders such a strong sense of pride and national identity. It follows that the culture and pattern of success attracts new talent to it, with the inevitable dream on the part of the many young males to be an All Black. So the culture that has bred success also perpetuates the ongoing success of itself – the sport attracts the majority of the best playing talent in the country. From a business perspective this highlights the importance of building the right culture in an organization. The right high performance culture in itself attracts the talent required to perpetuate the dominance and prevalent culture. Understanding the values that the All Blacks have built that culture around is where the real lessons are for us as business owners. Ultimately this is an organisation that values high performance and success. Winning is not an aspiration – it is an expectation. Commitment is fully committed. Like the chicken and the pig in bacon and eggs for breakfast – the hen is involved….but the pig is totally committed. Do you doubt the commitment of these guys as they line up and perform the haka at the beginning of a game? The team is far more important than any individual star. Any individual star must reflect the team values, or the team itself manages the individual – long before management have to intervene the players themselves are working to protect their collective identity and reputation. It is perhaps not surprising that this is continually the most disciplined and well drilled rugby team in the world. They have an incredible work ethic….and practice, practice, practice in the pursuit of perfecting their business. The culture is built upon some very simple, but core values, that are unshakeable. Those that do not reflect the values do not get to stay – no matter how talented they are. The culture has its rituals – many of which will never be known by distant outsiders like myself. But one particular ritual intrigues me enormously. The All Blacks are famous for performing a traditional Maori challenge – The Haka. They do it against all comers before a game – lay down the challenge openly and aggressively. But when a new member of the team joins the All Blacks, the incumbent team members welcome the new member with a personal Haka apparently. Think about the power of that. All of the history, the culture, the kudos and mana that the All Blacks have is thrown down in a welcoming gesture to their newest member – yet it is also a challenge to the new addition to the team. It is something that would be highly honoured for a newly selected All Black, but it is also an act that establishes immediately the highest of expectations. The culture is worked on deliberately and passed on continually. And within that culture is a recognition and acceptance that change and constant innovation are required to stay on top. Every All Black team enters a new “business season” with a clear plan about how they will innovate and perform better than the year before. They know that what worked yesterday is probably not going to be good enough tomorrow. The All Blacks are not just a sports team, they are big business. Their commitment to maintaining a culture of excellence, performance, innovation and respect is evident. Their commitment to the culture first though is even more evident. That is the key lesson for any service business that wants to build lasting success.